Mamaw, 1925-2018. « Midlife Crisis Crossover! 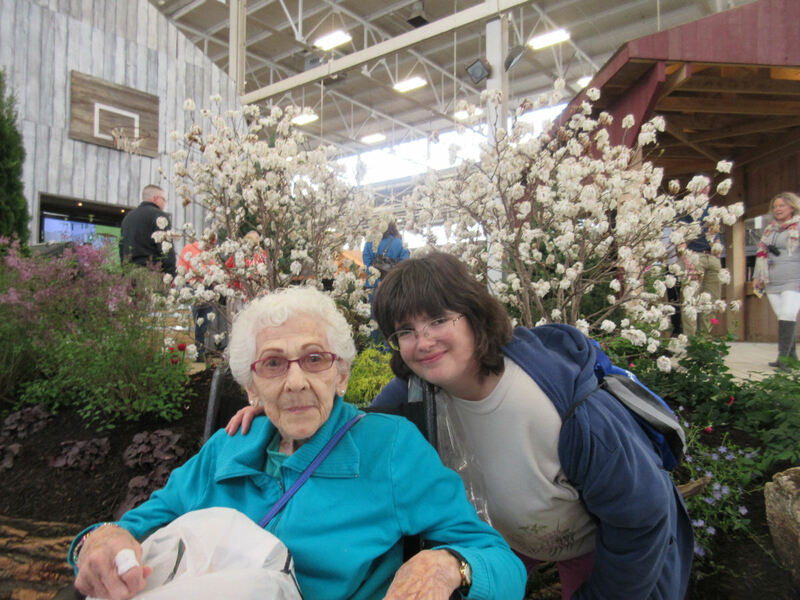 Anne and her Mamaw at the Indiana Flower & Patio Show 2016. 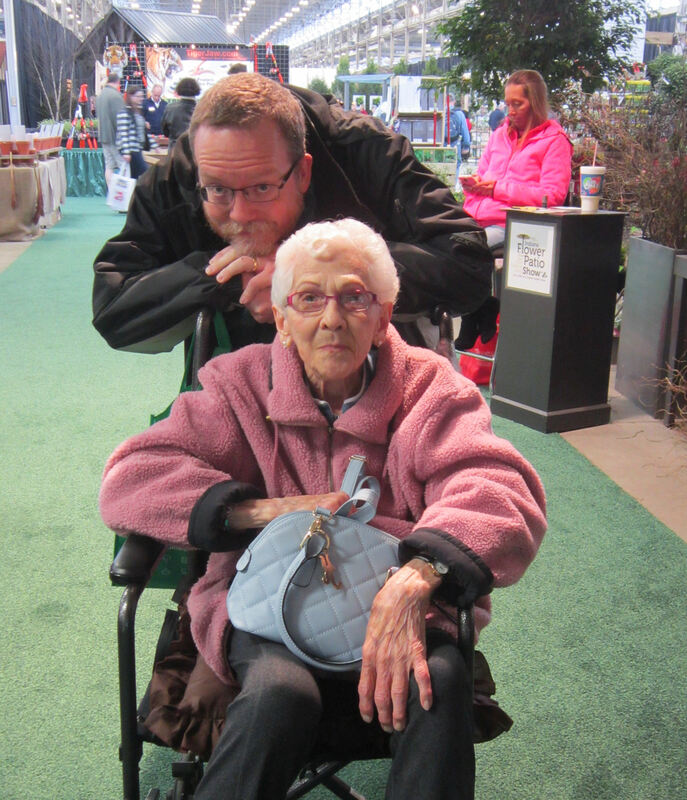 Previously on Midlife Crisis Crossover: from 2011 to 2017 my wife Anne and I would take her grandmother out twice per year to the Indiana State Fairgrounds for her two favorite outings: the Indiana Flower & Patio Show every May, and the Christmas Gift & Hobby Show every November. For Mamaw the fairgrounds were her premier destination for getting out of the house, buying presents for loved ones, stocking up on her favorite dark chocolates, marveling at strangers’ cute little babies, getting her watch battery changed at her favorite jeweler’s booth, oversharing about her medial conditions with any salesman who dared approach us unsolicited, and, for the last several affairs, relaxing while I had the honor of being her wheelchair chauffeur, uttering the occasional “Wheeeeee!” whenever we sped up while descending ramps and slopes. Longtime readers have seen several pictures of her throughout the years, enjoying what were basically her Super Bowl and her World Series. Thursday morning, Mamaw passed away after a long, loving life, six days before her 93rd birthday. The two of us at the Christmas Gift & Hobby Show 2016. Mamaw was born during the Calvin Coolidge administration and lived longer than all but two American Presidents. I’ve known her for over twenty years, ever since Anne and I began hanging out together full-time. Her husband was a WWII veteran who refused to talk about it, and who passed away probably a month or two before I might’ve gotten the chance to meet him. For decades she’s been living in the house he bought for her. She was still cooking Thanksgiving and Christmas Day feasts for the entire family well into her late 80s. She did it so well that it was hard for anyone to work up the willpower to object. She was there for Anne at the worst points in her life, accommodating and serving and helping and loving in ways I can’t begin to sum up here because those stories aren’t mine to tell. It took about ten minutes for her to welcome me into the family unconditionally. 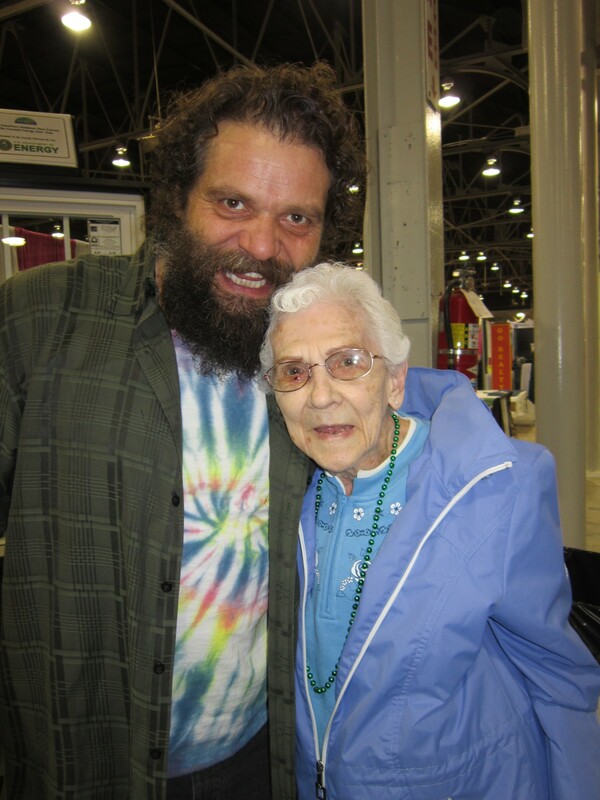 That time she met TV’s Rupert Boneham at the Christmas Gift & Hobby Show 2011 when he was running for governor. He delighted her with a free autographed copy of his book. Mamaw leaves behind three kids, several grandkids, and an army of great-grandkids. I think the family has finished stage 1 of the grieving process, the awkward notifying of everyone throughout their sprawling family tree. Tomorrow comes the sorting out of the arrangements. They haven’t yet worked up to the stage where they start squabbling over her colossal stashes of photos, antiques, and other possessions of mostly sentimental value. For now we’re at the stage where everyone floods Facebook (or, uh, their blog) with all their best anecdotes, photos, and a couple of fun videos. We miss her deeply already, but celebrate that she’s no longer confined to that fragile mortal body, which weighed about fifteen pounds soaking wet and which she looked forward to moving beyond. 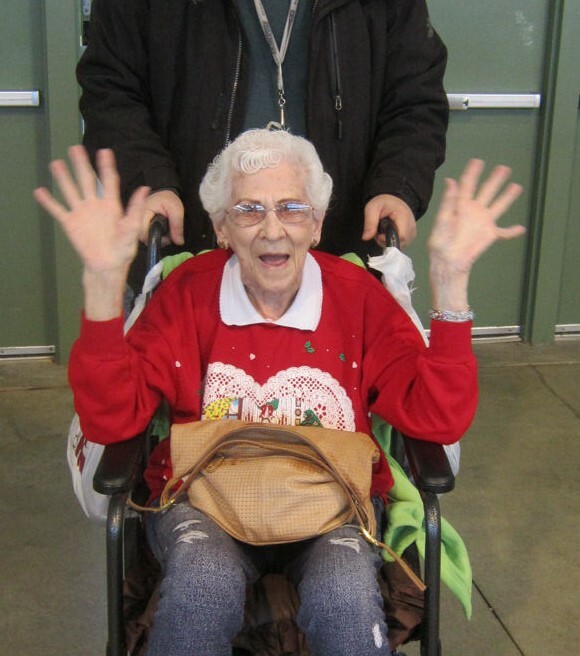 That time Mamaw did jazz hands, months before we apparently stole this and made it our thing. Thank you for sharing Mamaw with the rest of us and condolences to your family.